BEETLE ALERT !!! BEWARE !!! Truffle and Conker found LOTS of huge ROSEMARY BEETLES amongst the seeds sent to me by Paulthegardener. Lol. Brilliant Picture Terra, can't get over how much Truffle has grown and Conkers looking Great! Lovely to see Conker looking so well, he has such a lovely gentle face. Isn't Truffle looking handsome? Quite the man, beautiful fine head and expression. I don't know how you get terriers to do tricks, mine won't even chase balls or anything so I doubt I could get them to hold or carry something, but Rosie is quite good at rolling on her back for a tummy tickle. They are still wagging furiously though, without any sort of training! NOT QUITE THE COLOUR OF THE BEASTIES IN MY GARDEN, BUT VERY IMPRESSIVE, NONETHELESS .Goodness knows the damege they would do to my Lavender plants!! Nice photo Tt. Conker and Truffle were amazed to find these HUGE beetles coming out of your seeds envelope. Lol. No wonder I had a job sticking the envelope down!!! Yes, thanks, Pondlady. Conker is looking well. I like your pals TT. 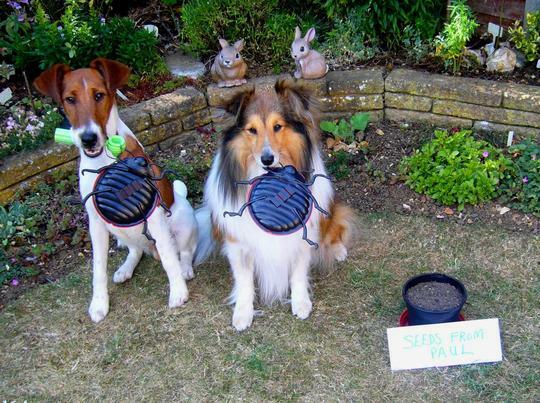 They look very well behaved, especially the one on the left. lol. I was surprised Truffle held the stick so well. He must enjoy doing tricks with you TT. I hope Conker is ok.
Hellow Conker and Truffle.Hi Terratoonie-plz keep us update about Conkers treatment.Thanks. I'll put an update about Conker's treatment near the top of my current blog later today after our vet clinic appointment. Hope that blood count has gone up - will be sending positive thought waves to you this afternoon. Looks like they're getting to grips with the rather large bugs in your garden. Nice to see Conker looking well and hasn't Truffle grown too. What a beautiful pic of your two boys! they are both gorgeous, and obviously sooo well trained, and little Truffle has grown so much! Good to see that Conker is looking well. God bless him. Wonderful photo of them, they are beautiful. They are so clever too, any tips for Todd LOL. Today we met 4 dogs over in the field, and for the first time in the 5 months I have had him, he never snarled at any of them, lay down and seemed quite relaxed. I was over the moon. It was his aggression to other dogs which led to his 10 months in the Dogs Homes and almost euthanasia, maybe this is the start of him beginning to accept other dogs as something other than a threat. ... yes, let's leave the jokes to Graeme Lol. I'm pleased you like this... Lol. The bad jokes aren't worrying me. In fact, 'I Feel Fine' . I suppose there's no need to 'Twist and Shout About It' !. I'd better stop now or I might give my age away! Oh yes, of course Tt!!! Lovely photo of the dogs, TT! :) I'm so glad Conker is beginning to look sooo much better! My, hasn't Truffle grown! Almost as fast as the Russian Vine, a.k.a "Mile-a-minute-Vine"! lol!!! Looking forward to the time when he no longer needs his chemo any more. Such a lovely looking dog! Yes, you can see Truffle's mile-a-minute legs in this pic. Lol. They are both beautiful and look so happy together. I'd like to know how their white bits stay so white - Sophie would definitely Not like to know! I decided to choose a happy, fun photo of my dogs. You can see one of the real beetles on Paul's photos ! Lol. My dogs lick their paws, just like cats do, and that keeps them clean. S.O.S.!!! I need the beetle-busters in my garden!! Send 'em over! I'll pay them with lots of treats! The boys are looking great TT. I hardly recognised Truffle. The rabbits in the background look like a couple of posers. Glad Conker is looking better. Truffle is becoming quite a character... the rabbits are better behaved. Lol. Conker still looks his handsome self and happy to do tricks...that is so good to see. How Truffle has grown and what a handsome boy he is. ...Poetgardener coined the phrase, and I love it. Lol. Yes, Truffle is fully grown now.... mischievous... Lol. Gosh hasn't Truffle grown!! and Conker looks really well TT i'm glad to see, Toffee still sending wags he's teasing next doors dog Ben at the moment he sits at the fence (they can't see each other) and Ben comes along and sniffs at the bottom of the fence then Toffee pounces with paws and claws!!! Ben keeps coming back though daft dog LOL! Just caught up with this fab pic TT......Conker is looking quite well, and look at Truffle......he's a very handsome teenager....:o) Playing beetle drive? Lol! Yes, Conker is doing well... still gets tired very quickly. Thanks for the wags. Conker is a very gentle dog and I think he would make friends with Toffee. Funny that Ben keeps coming back to find Toffee. Lol. Sorry late to this...great photo.Those bugs get everywhere ! My dogs are enjoying the garden a lot more than usual this summer because with Conker unwell, we're not at the usual charity dog shows.. Please tell Henry than in order to catch lily beetles he first needs a green stick, just like Truffle is holding. Lol. Guess what colour these beetles are if my dogs turned them around ? Truffle and Conker not only had to hold the beetles, they had to not twist them, so that just the black sides show... Lol. Oh..goodness you mean they caught both purple "and" red beetles...well now I am super duper impressed! Good job on them not showing the other side..they are truly very talented! My beetle busters will catch any size... the bigger the better. Lol. I'm keeping Conker out of the sunshine most of the time. Truffle is a bundle of mischief...but lovely. Goodness - how Truffle has grown!!!! Truffle is sitting very upright in this pic.... I think I would sit up, too, holding a huge beetle like that. Lol. I hope your brother's dog is doing well ? Lovely pic TT. truffle certainly has grown. Conker is looking good and is obviously showing interest in his enjoyment of life. They are both so lucky to have you as their mum. Lots of love to you all. Yes, Truffle is full size now. Lol. Conker is doing very well on the clinic treatment. What a great photo. TT.....Truffle has grown soooooo much since you last photo of him. He must be eating you out of house and home. Conker looks adorable as usual. He is such a sweetie. Glad to see they are keeping you safe from monsterous giant beetles. LOL. I'm wondering if Truffle thinks he is a Shetland Sheepdog.... he copies everything Conker does.... maybe he's hoping to grow a big fluffy coat like a Sheltie..Lol. I thinkk he has ambitions to be a shetland pony TT. Get him entered for the next show jumping show, quick. He'd enjoy wearing a nosebag..... food available at all times. Lol. I'll share mine with him. Please tell him that puppy food is exactly my kind of fare. I am but a young pup myself. Thanks TT, all us youngsters should stick together. I am past puppy food myself..do they have Old Dame food? sorry Truffle..you would not like my Old Dame food..or I would share with you...especially if you are going to be pulling carts and show jumping..! I think Flash might be more likely to take lessons from Truffle...lol..
All the best for tomorrow TT. Cat, "old dame", I don't think so! Conker has just enjoyed a thorough grooming. Good for you. I bet it makes him feel better too. If you look at the photo near the top of Conker's right leg, you can see one of the shaved areas. He has several like that on his legs and neck where tests are carried out. Luckily Conker has lots of hair, so he still looks lovely. I noticed those spots TT..he is very handsome for sure..no matter what..
Good luck tomorrow TT and Conker. Do you think Truffle will develop a complex when he doesn't develop a long fluffy coat like his hero Conker? Truffle says he is willing to eat a lot in order to grow a long fluffy coat. Lol. The giant beetle invasion was while you were away. Lol. What I beautiful photo TT , I,ve been longing to know how Conker has been improving he,s looking very handsome here .. I can,t believe how much Truffle has grown he,s like a teenager .. The latest on Conker is in bold print towards the top of my Wagging blog number 19. and under my latest photo. I liked the features in the back ground.. Thanks for visiting my pic.